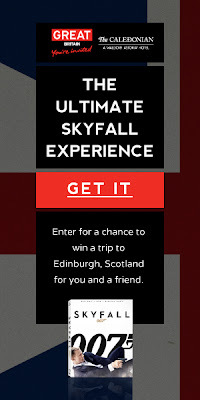 In celebration of the recent Skyfall Blu-ray, DVD and Digital Copy release, Twentieth Century Fox Home Entertainment and VisitBritain have partnered with UrbanDaddy to create a luxurious and exciting giveaway, offering fans a chance to win a once in a lifetime James Bond experience! The trip for two to Edinburgh, Scotland includes a three night stay at The Caledonian - A Waldorf Astoria Hotel, a Land Rover safari in Glencoe, Scotland (where Skyfall was filmed), a master class in blending your own whiskey at Glengoyne Distillery and more! You only live twice, – so be sure and enter to win this incredible experience!